Left to right: Command Sgt. Maj. Harris, Lt. Col. Cory Plowden, Brig. Gen. Jeff Broadwater, Command Sgt. Maj. Edison Rebuck, on hand for the presentation of the Army Strong Ward flag. After five years of training and safety improvements, Weed Army Community Hospital received the prestigious Army Star Strong Award June 29. 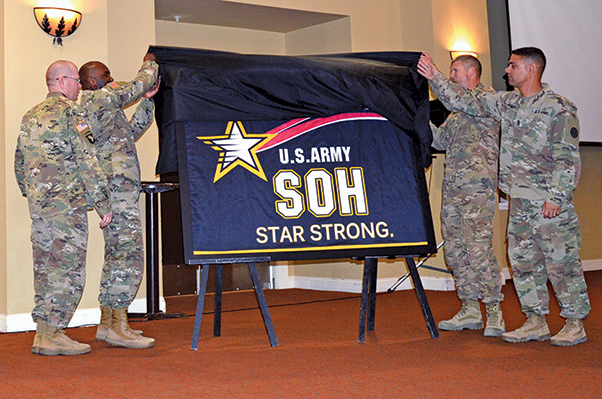 Held at Sandy Basin Community Center, the Army Star Strong Flag Presentation began at 1:30 p.m. with a turnout of approximately 175 people. Sal Adame, the current Safety and Occupational Health Manager for Weed Army Community Hospital, said the hospital must “keep this success going” and the actions taken to receive this award must remain a “way of life” in the future. The Army Star Strong Award indicates units have implemented the Army Safety and Occupational Health Safety Management System, requiring completion of 243 tasks in three stages of progressive assessments in the span of three years. Weed Army Community Hospital is the 34th site in MEDCOM and fourth in the Regional Health Command Central Area to receive this award this year, marking the hospital as an “exemplary work site … that exceeds requirements at all levels,” Adame said. After beginning the process of reaching this award back in 2012 under the supervision of Adame’s predecessor Dan Whittemore, Weed Army Community Hospital overcame various obstacles to see this process to completion, earning the award at last this year. 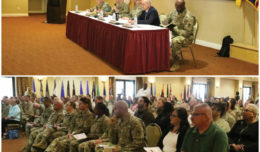 According to the event’s flyer, the process toward the Army Star Strong Award consists of ensuring all policies and standard operating procedures are in written form, ensuring these policies and procedures fit the daily activities of the units and ensuring all workers understand these policies and procedures to create a safe environment. After completing these tasks, members of the MEDCOM Safety Office and members of the Department of Defense Safety Management Center of Excellence confirm the unit’s safety management system is at the highest standard. 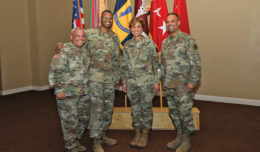 As Whittemore’s successor, Adame said Whittemore built the foundation to work toward the Army Star Strong Award and Adame saw the process through to completion. “If we can keep employees working, happy and safe, then they’re going to be able to provide better care,” Adame said. 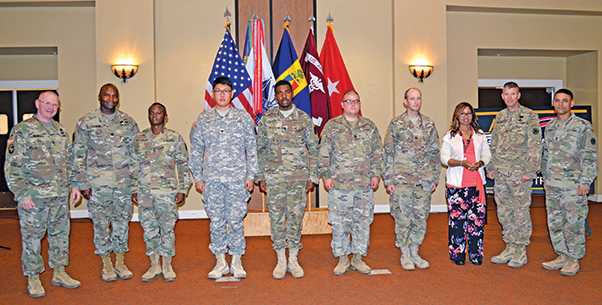 After the presentation of the Army Star Strong Flag, the following members of the Weed Army Community Hospital staff received special recognition for their effective roles in achieving this award: Luis Pedregon, Sgt. Alfred Muthangya, Spc. Daekwon Yoo, Sgt. Marinela Sario, Spc. Damon Oliver, Staff Sgt. 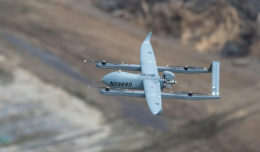 Michael Rizor, Staff Sgt. Glen Pogue, Leslie Smith-Pedregon, Anthony Berry, Garth Lacomb, Paula Mueller, Crystal Tolson and Zing Sloan.